A wonderful nutritious juice full of antioxidants. Antioxidants protect the body from harmful chemicals called free radicals. Antioxidants play a role in management and prevention of many medical conditions such as macular degeneration, Alzheimer, some cancers, atherosclerosis (blood vessel disorders). Juice all together using a cold pressed juicer. We use a Kuvings cold pressed juicer. Smoothies are perfect, versatile and nutritious for the whole family, particularly kids. They are easy to digest, boost metabolism, build muscle mass and can even improve athletic performance. You can add protein powder to any smoothie, there are many protein powders that are also vegan or vegetarian too, so something for all. Whether you are always busy or your kids are fussy, smoothies are quick and easy to make and allow you to consume your daily fruit and vegetables. 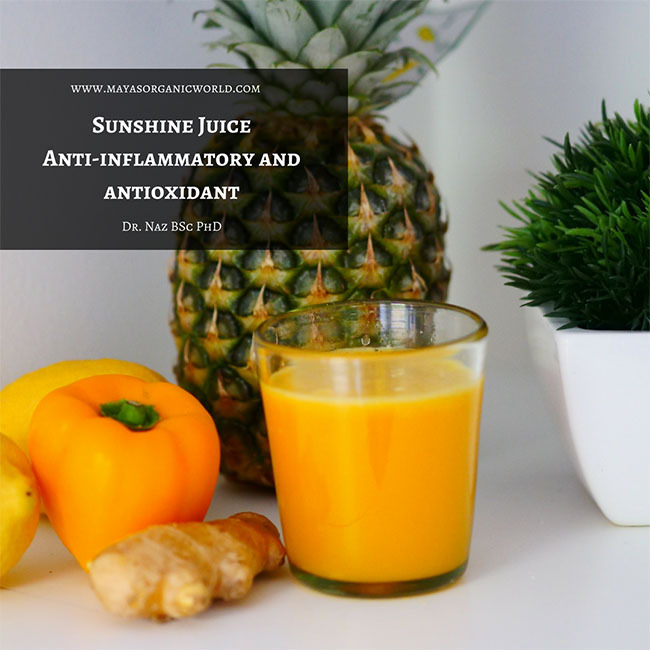 Foods and smoothies high in antioxidants boost immunity by antioxidant molecules interacting with free radicals and terminating the chain reaction that damage vital molecules in the body. The beauty industry is a big business and many spend thousands on beauty products. However, beauty starts from within, nutritious smoothies offer a wide range of vitamins that promote radiant, skin, hair and nails. Phytochemicals, anti-oxidants, beta-carotene, vitamin C, Vitamin A, fiber, calcium, magnesium, manganese, folate, potassium, copper, vitamin B6, iron. We do offer an online bespoke functional medicine therapy program that includes a deeper look at biochemical individuality, deficiencies, health, symptoms, well-being and antecedents. A full bespoke diet plan is given, tailored to your needs. To book a consultation, please email dr.naz@mayasorganicworld.com.